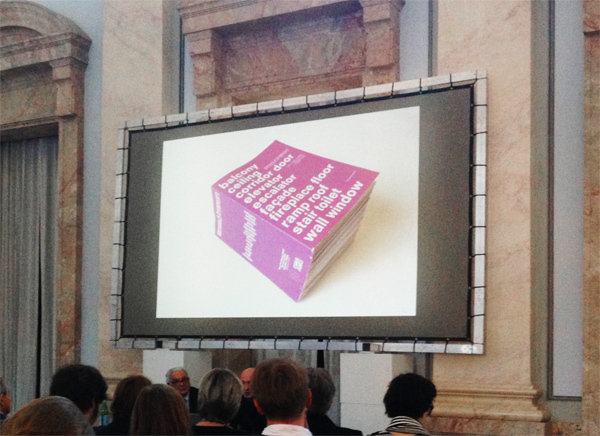 Heavy hunk: Rem Koolhaas shows at the press conference in Berlin a picture of the Biennale catalog. 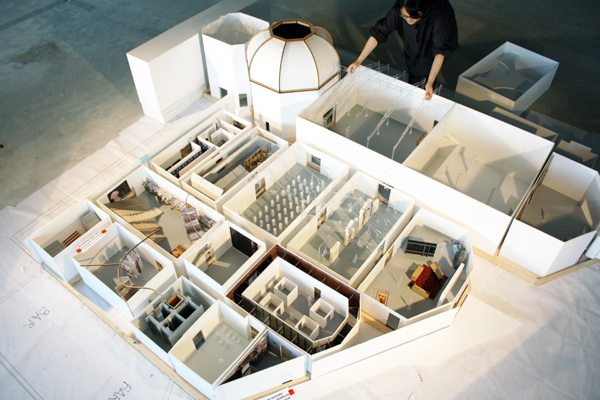 "Elements of Architecture" at the Central Pavilion: Model in progress. 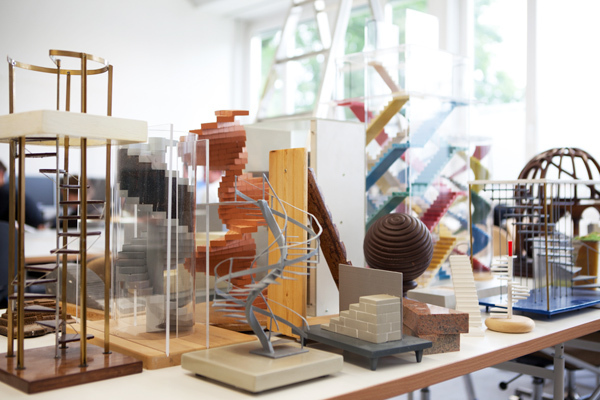 Stair-Models at the Friedrich Mielke Institute of Scalology. 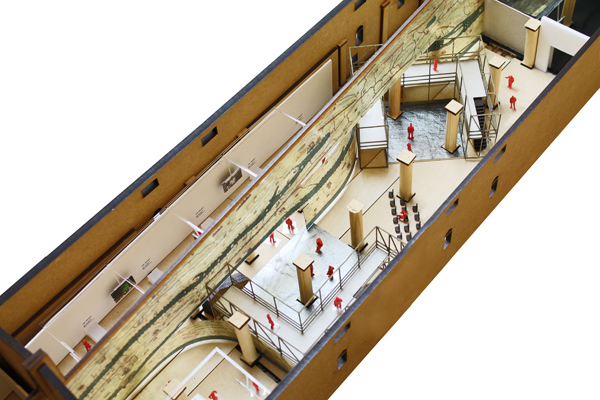 Modell with the „Tabula Peutingeriana“ for the exhibition "Monditalia". Another modell for the exhibition at the Corderie. What is different about this year’s biennial is that all the country pavilions will devote their shows to a set theme: “Absorbing Modernity 1914 – 2014”. Paolo Baratta, the Biennale’s president, diplomatically spoke of a “proposal that was accepted by most.” And that includes the 11 “new” countries by virtue of whom the total of nations presented has increased to 65. How Koolhaas and the Biennale team succeeded on convincing the large number of curators that the focus be on the past and not the latest hype remains a secret. But it could spell a pleasant thematic concentration instead of the confusing diversity of themes that otherwise prevails in the Giardini. It is not as if there is not almost always an overarching Biennale theme, but often it has been formulated so loosely that all country contributions somehow fitted it. 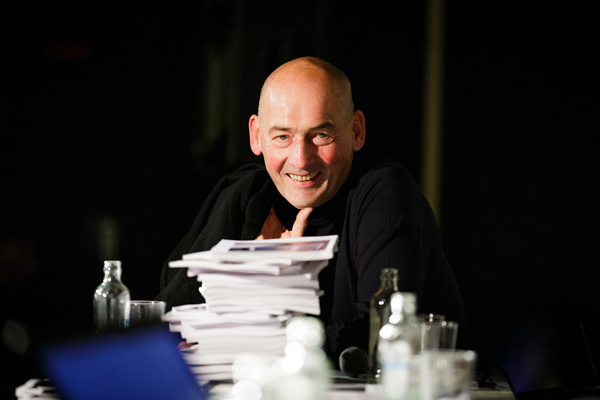 Koolhaas emphasizes his approach with some of his famed poignant graphics. 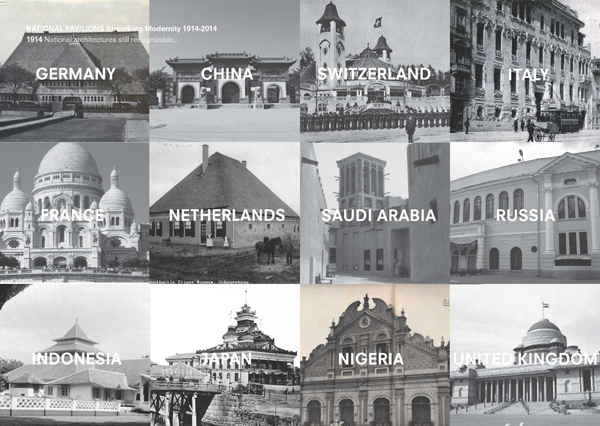 A plethora of picturesque buildings in China, Nigeria and Europe dating from 1914 compare a century later with the identical glass facades of monotonous skyscrapers the world over. Simplemindedness instead of diversity in the globalized world. The critique of Modernism gone wrong is not entirely new. The very first architecture biennial in 1980 bemoaned the uniformed gloss and the crisis of architecture – presenting instead the new postmodernist stars. Since then Venice has presented the one or other flop, trend and superstars only to have forgotten them two years later. This time there’s to be no person cult and no catwalk, and each country is instead to cast a glance back at its own history. At least at the Venice art biennials the national methodology is increasingly becoming suspect with the one country inviting an artist from another to plan the pavilion, or pavilions even get swapped. Koolhaas and the curators of the country pavilions are going in the opposite direction and taking the biennial as an opportunity to explore the global history of Modernism together and research how it functions as a building block of the so-called “fundamentals”. What seemed in the initial announcements to be a conservative step back to the roots turns out to be an astonishing study of the radical details of architecture. 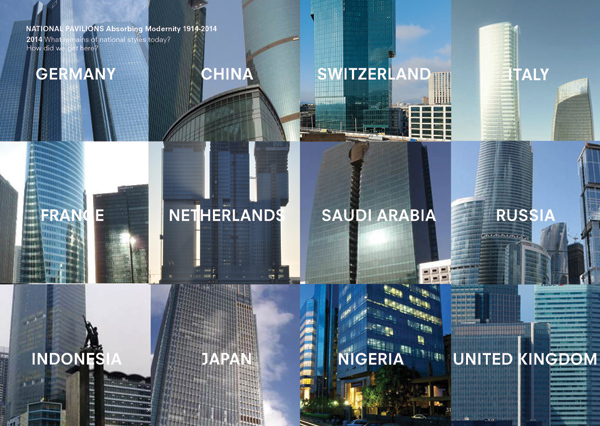 In Koolhaas’ version, it becomes a contradictory and amusing narrative told in powerful images. A collage with different balcony scenes, used mainly as the propagandist stage for dictators and revolutionaries alike, and it was greeted with benevolent mirth at the press conference in Berlin. Koolhaas had requested more time for the preparations and to research the exhibition and had involved several universities the world over. Thus, the history of the window (at least in the visually effective exaggerated version) can also be that of the disappearance of a basic architectural element. Electric illumination in open-plan offices and air conditioning assume key functions of the window and thus also change architecture. 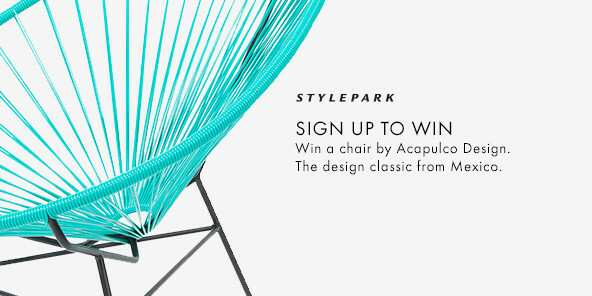 It will be exciting to see what the glance back at the past offers for the future. The “Elements of Architecture” show will be a tour of the Italian pavilion – a different detail will be addressed in each of its various rooms. This will be visualized with different means, for example an automated window production line, traditional Chinese roof structures, and the collection of the Regensburg Institute for Scalology (research into stairs). A photo of the catalog gives an idea of how seriously Koolhaas goes about dissecting architecture: It will probably be the thickest and most unwieldy catalog ever to be bought at a biennial. Italy is to be found this year in the Cordiere, with a major show on “Monditalia”. However, less for nationalist reasons and more as a prototype for countries in a process of transformation – “full of opportunities, contradictions and political turbulences,” as Koolhaas puts it. By way of a staging and framing element, an enlarged historical map will be spanned the length of the halls of the Medieval rope workshops – which are over 400 meters long. The map, a parchment roll itself almost seven meters long, is known as the “Tabula Peutingeriana” and presents the road network in the Late Roman Empire in different stages of completion, with routes running as far afield as England and India, thus highlighting the sheer scale of the former world empire. This map presents the historical location of the 41 different contributions to “Monditalia”: The exhibition with thus include disparate locations and themes, such as a detour to Pompeii, the “Biblioteca Laurenziana” in Rome, projects by Superstudio and a study of Italian discos since the 1960s. Anyone who still has an idea of the overall picture will certainly find themselves taken to the limits of what the human mind can absorb when confronted by the accompanying program. The Biennale sections on dance, film and music, which have hitherto been presented separately, will for the first time guest at the Architecture Biennial this year.